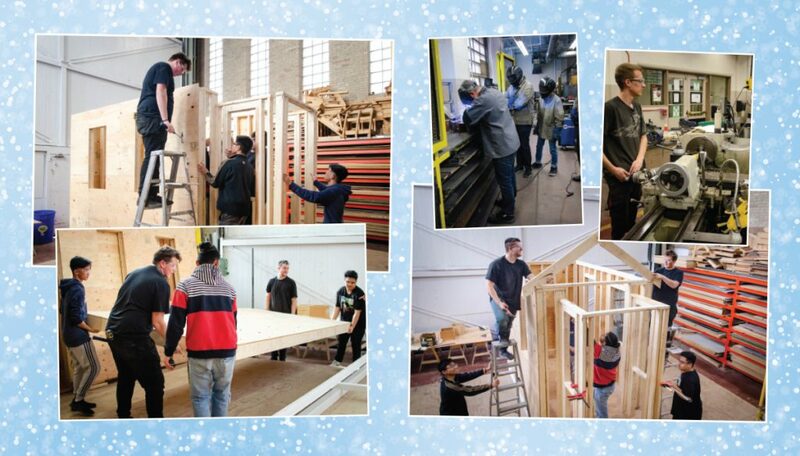 Carpentry, machine and welding technology students at Tec Voc High School are hard at work building a one-room schoolhouse to help commemorate the MTS centennial. The schoolhouse, designed by students in the design and drafting program, will spend the winter on The Red River Mutual Trail (river trail) at the Forks. The design, based on a generic schoolhouse, uses a few modifications to fulfill its main function as a warming hut e.g., there will be benches to allow for greater seating capacity as opposed to individual desks. As part of our ongoing commitment to literacy, a little free library, stocked with a variety of books will be included in the hut. We encourage you to visit the warming hut, take a photo and share with us through one of our social media networks, and join us in celebrating 100 years of standing up for public education.